On Tuesday, I had the pleasure of participating in the discussion following a read-along of Started Early, Took My Dog Kate Atkinson. I was a late arrival to the discussion, but I really enjoyed having the opportunity to interact with other readers. Here's what I contributed to the discussion (plus a few points I've thought of since then). • While STARTED EARLY is definitely a mystery, it is also a fine example of literary fiction. In fact, critics and booksellers have both classified the Jackson Brodie books as mystery and literary fiction. What are some of the elements of this novel that make it "literary fiction?" This is the first Kate Atkinson book that I have read. I don’t read a lot of mysteries, but I was attracted to this one when I saw that the Jackson Brodie books are often classified as literary fiction. I can definitely see how that description applies. The narrative is rich, detailed, and the characters are dynamic. I will admit that I didn’t get into it right away, but once I had gotten to the scene where Tracy makes her special purchase (the adorable 3 year-old Courtney), I was hooked. I did drift a bit when the story switched to Jackson Brodie. I wasn’t sure how the two stories would come together. Once I started to figure it out, I was completely back on board. Many mysteries end up being formulaic and stale, and that's why I've stopped reading them as often as I once did. Atkinson has convinced me to give mysteries a second chance. • It was very interesting how the story went back and forth between present day and the 1970s. This format worked extremely well to not only present clues into Hope's mysterious childhood, but it also demonstrated a great deal about the basic nature of human's needs and desires. What were some of the themes about people's behavior that struck a chord with you? What I enjoyed most about this novel is the attention to detail in constructing the plot. Nothing goes unnoticed or gets left behind (except Courtney’s backstory – I think there’s going to be more there, but perhaps Courtney needs to be a bit older first). Balancing all of those story lines and bringing them together the way that she does is quite impressive, and it makes me want to keep reading the series (and to read the ones that I have missed). I think is at those moments when the story lines intersect that Atkinson says the most about human behavior. Both Tracy and Jackson see someone abusing another living being and react suddenly and decisively. While some people might consider these reactions extreme, they both knew that they could do some good if they acted immediately. They did what so many others wish they had the nerve to do, and that makes them stand apart in the best possible of ways. • One of the themes that was apparent throughout this novel (and other Jackson Brodie books) is lost or abandoned children. What was the role of "lost girls" in this story? And if you're read any other Jackson Brodie books, how did this theme relate to other lost girls in Jackson's life? • Another discussion topic that really stood out to me (and definitely caused me to think) was the difficulty associated with becoming a mother. In STARTED EARLY, TOOK MY DOG, the reader sees a number of women who have issues when they discover themselves facing pending motherhood as well as the loss of a child . Discuss some of the characters' different actions in this story as they relate to motherhood. One of the questions mentioned the “lost girls” who appear throughout the novel, as well as the women who have trouble conceiving. “Lost girls” would seem to refer to girls who have been stripped of their identities. They do not get the chance to pursue the opportunities that would have been available to them. They do not get to be the women that they were meant to be. In this sense, the women who have trouble conceiving are also lost. They miss out on being identified as mothers, and they miss out on the opportunity to bring a new life into the world, and to nourish that life. They do not get to be the women that desperately wanted to be. Tracy is one of those lost girls. She buys Courtney because she is trying to find herself. • What do readers find Jackson Brodie so appealing? If a movie was being made of STARTED EARLY, TOOK MY DOG, who do you see playing Jackson? Liam Neeson could be Jackson? Maybe? What are some of your thoughts? 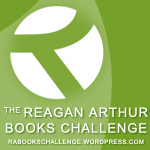 Share them here or at the Reagan Arthur Books Challenge Blog. I hope you enjoyed reading someone else's perspective on books. I hope you will visit her blog as she includes a wide variety of book related topics. Would you like to see posts from other bloggers I know? Let me know by leaving a comment. Hey Cassandra, lovely review! I really love her novels and can't wait for this one. Blog swap is a great idea, and Liam Neeson is an excellent suggestion! Hi Donna, I'm a new follower. I loved the blog swap this week and am really enjoying your blog!